A gift of a life insurance policy allows a donor to make a considerable future gift to the Nature Conservancy of Canada with a relatively small financial contribution. Life insurance is a great tool used for tax and estate planning in order to maximise your gift for conservation while reducing taxes and leaving more to your family and loved ones. If you have an existing policy that has finished serving its original purpose, you can transfer the ownership and name the Nature Conservancy of Canada as a beneficiary. A charitable tax receipt will be issued for the value of the policy at the time of transfer and for any continued premium payments. You can purchase a new insurance policy and transfer the ownership to the Nature Conservancy of Canada. You continue to pay the premiums and will receive a charitable tax receipt for those payments. The transfer of ownership of the policy is irrevocable. If you prefer to retain the ownership of the policy, you can name the Nature Conservancy of Canada as a beneficiary and your estate will receive the receipt for income tax purposes, helping reduce or eliminate the taxes. Affordable annual premiums, which convert to a large gift for conservation. You receive a charitable tax receipt based on the way the insurance was gifted. Gifts of life insurance are not included in probate. Depending on your current financial, personal and tax situation, there are many strategies you can implement to achieve your personal goals and leave a significant legacy for nature. Our gift planning team can provide information on the tax implications and help you to explore other ways of giving through life insurance. 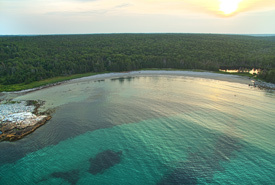 Please contact our team at planned.giving@natureconservancy.ca or 1-800-465-0029 ext. 2276. The information provided on these pages is general in nature and not intended to be a substitute for professional advice. NCC strongly suggests that before making any decision concerning your estate and your charitable donations, you seek advice from your lawyer and financial advisor.